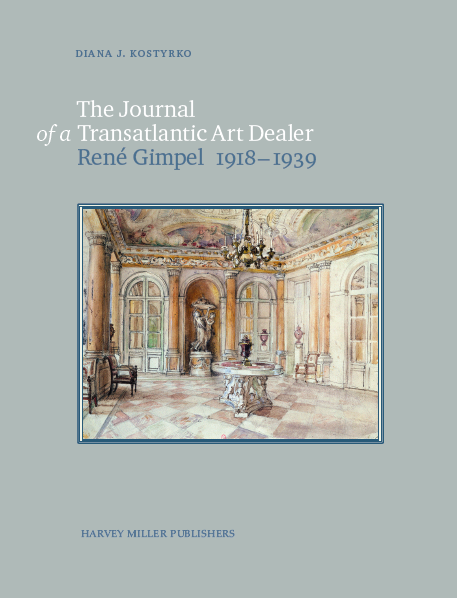 The journal of the transatlantic art dealer, René Gimpel (1881-1945), is evaluated for its legacy. The transatlantic art dealer, René Gimpel (1881-1945), maintained an interwar journal for twenty-one years until, like many Jews in France, he was overtaken by radical political events. In this book, Diana Kostyrko explores why Gimpel’s journal should be taken seriously as a sociohistorical document. In contextualising the journal, including its reception since first published in 1963, she intercuts art history with material culture and a sociology of modernity. Firstly setting the art dealer in context, the author examines the dominant themes which thread through the journal ‑ ranging from the escalation in power and status of European dealers catering to but also rivalling wealthy private collectors, to the irresistible pressure of twentieth-century modernity on collecting practices. For all those who are concerned with the European formulation of taste in the fine and decorative arts in the early twentieth century, the trend for eighteenth-century revivalism in France and North America, the acculturation of American museums, and the rise to stardom of the modern art market on the back of the auction house will find much of value here. Overall the author undertakes to distil what René Gimpel’s legacy might be. Finally, she asks: was the Paris art dealer incongruously but ultimately a prophet concerned with the over-materiality of modern society, and a cultural pessimist to boot: or did he merely reflect a range of common perceptions abroad at the time? Dr Diana J. Kostyrko is an art historian and provenance researcher, and a visiting fellow in cultural history with the School of Literature, Languages and Linguistics at the Australian National University. Her next book, ‘In Disgrace with Fortune: transatlantic courtiers and capricious patrons’, concerns the short-lived phenomenon of the transatlantic art dealer.